The pattern is Raspberry Field by Jana Markova. The overall structure was easy to follow. The confusion started with the lace. I really wanted to include the lace because it added a certain something to the project, but the designer didn’t design the lace chart to account for the increases at the beginning (RS) and end (WS) of each row, and it didn’t account for the decreases happening along the spine. I had to think really hard about how to proceed with this section. Basically, for the first row, I went for it, started the lace where it should have started as per the chart, and I figured where to start each subsequent lace repeat by counting. Despite the challenges in making the lace, I’m very happy with the final product. It’s woolly and warm, admittedly a little scratchy (because it is VERY woolly), but so cozy. Let me tell you about my Saturday. For the last 12 years, there has been a giant yarn crawl in the City of Toronto, a fundraiser for an organization called Sistering: A Woman’s Place, “a multi-service centre for homeless, at-risk and socially isolated women in Toronto.” Recently rebranded as The Great Toronto Yarn Hop, I bought my ticket back in June and eagerly awaited this event! Here’s how it worked, in a nutshell. There were several ‘teams’ you could join (and buy your ticket for), and each team followed a particular route visiting a number of yarn shops; in Toronto, there is quite a large number! At the end of the day, all teams met at a pub where you could compare purchases, and raffle tickets, sold throughout the day, were drawn and prizes awarded. I joined Team Linen, largely chosen because I liked the first stop of the day, easy to get to from Transit, located in historic Kensington Market. Although I’ve been to Yarns Untangled before, I was looking forward to seeing what they had in the shop. After time spent at Yarns Untangled, and a skein of Robosheep Yarns Sock purchased, we jumped on the TTC and headed to Stop #2, EweKnit. EweKnit was the largest shop we visited, located at Bloor and Ossington, with a large main floor selling yarns as well as fabric and needlepoint kits, and basement set up with looms where they offer weaving classes. I was good to my budget, only buying a single ball of Classic Elite Yarns Liberty Wool, and it’s already earmarked for a project. With colours like that, how could I not? Our final stop was another shop I’ve visited before but was happy to return to Passionknit, on Yonge, north of Lawrence. At this last stop, my allotted budget had significantly dwindled, and my backpack was bursting with yarny-wonderfulness, so my sole purchase was a skein of Koigu Painter’s Palette Premium Merino (KPPPM), in their special colourway released for Local Yarn Store day. I had so much fun during the Yarn Hop. Six skeins of yarn, four shops (two new), and I met people from all over Ontario at this event. A cowl in progress was easily accessible during our travels, and I was able to get in a few stitches on transit. This was me, on Line 2 (Bloor) line travelling from Stop 1 to 2; stitches in progress, wide stance to prevent falling over. As I said, so much fun. Saturday April 21 marked the first (hopefully annual) Local Yarn Store Day, where fibre people were encouraged to go support their brick and mortar Local Yarn Stores. I have four in my immediate area, four that I love dearly, and I would have loved to visit them all, but Saturday ended up being a perfect storm of errands, budget constraints, and the beginnings of a cold. My errand running did put Soper Creek Yarn in Bowmanville right in my path, so of course I stopped in. I was there fairly early in the morning, sometime between 10am and 11am, and the store was buzzing with activity! Tina, the owner, had various sales on for LYS Day, and the big sign for LYS day was inviting. I was good to my bank account (the Toronto Knitter’s Frolic is April 28, after all, and one should budget accordingly), and I bought a skein of Cascade Heritage Sock in a lovely forest green colour. A few weeks previous from Soper Creek, I bought a beautiful speckled skein from Mineville Wool Project, and the green was purposefully purchased to compliment the speckles. In the past, I’ve written about why I love LYSs and why, I think, all knitters should support the LYS in their community. Local Yarn Shop Day was another opportunity to bring attention to the small businesses in our community, to encourage people to shop local, and to discover for themselves what’s to love about a LYS. I’ll be honest, I did find it hard to find a project that nicely incorporates five colours, but I cast on and I’m really happy with what I have so far. And I’m sure you were wondering, the yarn is Borgo de Pazzi’s Amore 160, a DK weight yarn. I’ll share my FO in a few weeks. Another reason why I love my local yarn shops! Last week, I found myself walking about Toronto with a little spare time on my hands. It was a toss-up between visiting the ROM or AGO, or going to a yarn shop. Not overly interested in either special exhibit being offered at the museums (but I’m sure they are wonderfully curated and exciting to visit! ), I walked over to Kensington Market and visited Yarns Untangled. Thanks to a newly created Heritage Minute, I learned earlier that week about the history of Kensington Market and how it grew and evolved to the niche neighbourhood it is today. Unfamiliar with Heritage Minutes? You must not be Canadian (“Dr. Penfield, I smell burnt toast!). Want to see the newest addition to the Heritage Minute collection? Head over to Historica Canada’s YouTube channel for new and classic parts of our heritage. Yarns Untangled opened in 2015, in the former home of Lettuce Knit. It was a cozy shop, with a table full of lovely yarn and beautiful finished objects greeting you as you walk in. The staff who was working that afternoon was friendly and happy to offer assistance as I asked for a specific circular needle for a project. And, of course, I bought yarn. They carried a wide selection with many indie dyers being profiled, including Riverside, based in Quebec, Ontario’s Blue Brick, and Lichen and Lace from Nova Scotia. I bought a lovely skein of DK yarn from Mineville Wool Project. 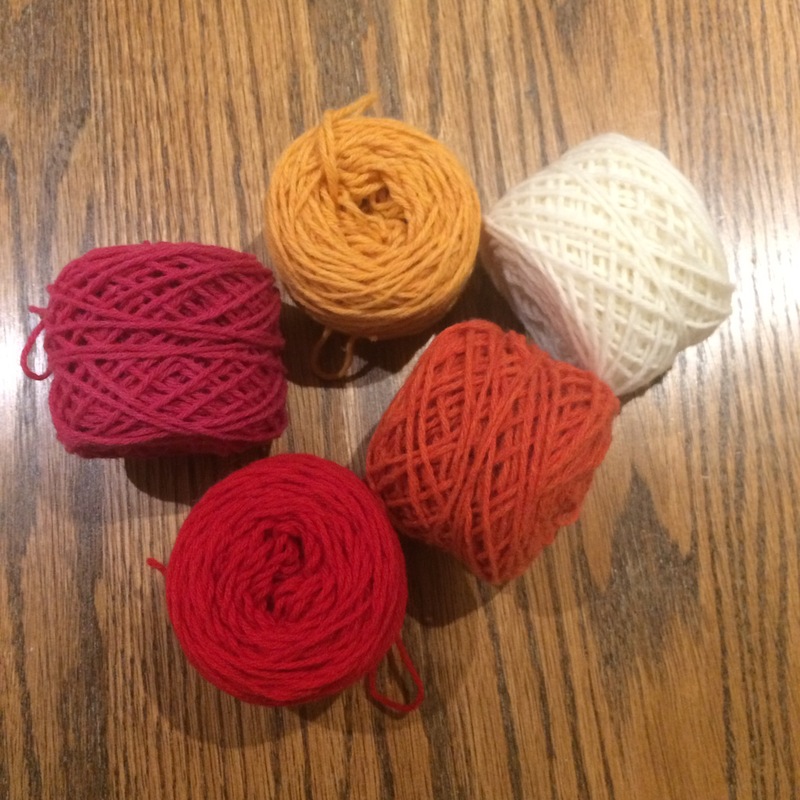 As YU describes on their website: “Part of the joy of the Mineville yarns is getting to name the colourways ourselves, and this time we chose the theme of Toronto landmarks and neighbourhoods.” The ON Science Centre colourway came home with me. For one year, between 2010 and 2011, I worked at the Ontario Science Centre as a Host. I walked around the Science Centre wearing a white lab coat talking to visitors and sharing cool science-y facts with them. My science knowledge wasn’t huge when I started; I was hired more for my strong customer service background. The science could be taught. It really was a fantastic year where I got to meet new people, share some of my enthusiasm, and the team of Hosts were some of the smartest, kindest, most awesome people I have been fortunate to work with. When I saw that this skein was named after a place I will forever have wonderful memories of, there was no way I was leaving the store without it. It will make a beautiful cowl, one with a fun tie to a special place for me.